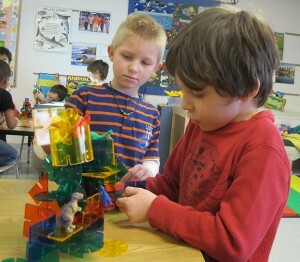 Students play with blocks at the Monroe County United Ministries in Bloomington. The child care center has a top-ranked level 4 rating through the state's Paths to Quality program and is nationally accredited. After Indiana lawmakers voted last year to fund all-day kindergarten, early childhood education advocates hoped it wouldn’t take another decade for preschool to get its moment at the statehouse. Conversations before the legislative session were encouraging. Newly elected Gov. Mike Pence voiced his support for pre-K programs like the successful Busy Bees Academy in his hometown of Columbus. Republican leaders, including House Speaker Brian Bosma, indicated they would look for ways to pay for preschool. Then a relatively modest pre-K pilot proposal for 1,000 students that passed easily in the House stalled when it reached the Senate Education Committee. Indiana is one of 11 states that doesn’t provide public money for preschool. State lawmakers say it’s because they just can’t afford to pay for pre-K, not after agreeing last session to fully fund kindergarten to the tune of an additional $80 million a year. “The pilot wouldn’t be too expensive, but the objective there is that it probably would work out and they’d want to come back and fully fund that, which could be $150 million a year, which would be a lot of money,” says Sen. Dennis Kruse, R-Auburn, who chairs the Senate Education Committee. But without the votes to get the $7 million preschool pilot out of committee, senators replaced it with a proposal to expand the state’s voluntary rating system for child care providers, called Paths to Quality. About 2,300 providers already participate in the Paths to Quality program, including Monroe County United Ministries in Bloomington. The center is one of just 261 with a top-ranked level 4 rating. Monroe County United Ministries child care center in Bloomington received a top-ranked level 4 rating on the state's Paths to Quality scale. To get a 4, providers must be accredited. 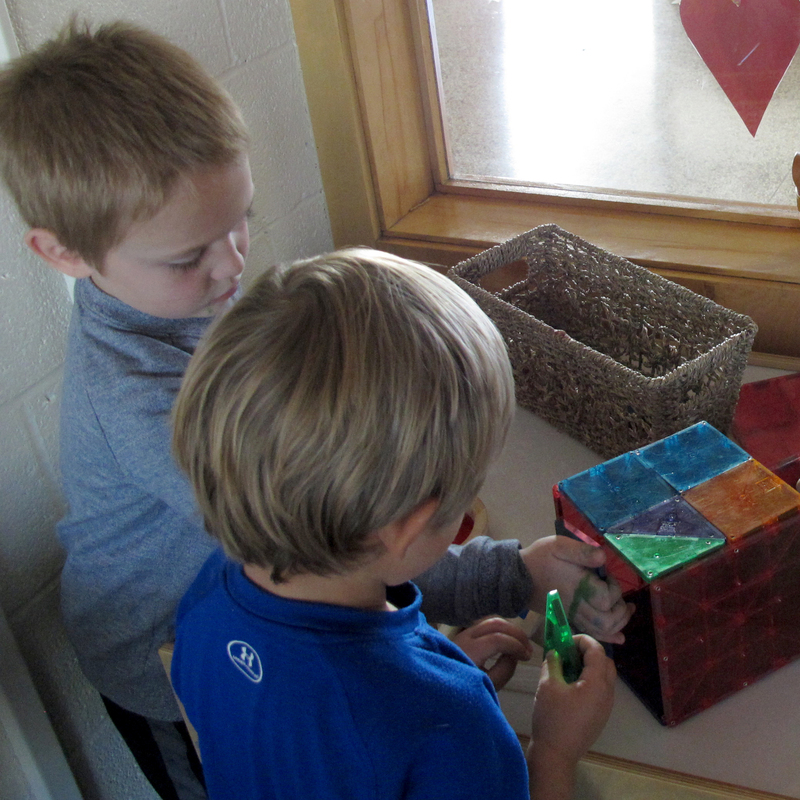 MCUM’s accreditation is through the National Association for the Education of Young Children, widely seen as the gold standard for preschool programs. “It’s a lot easier for us to have a program that we’ve bought into, that’s research based, that we know is going to lead to success for the program and for the kids,” says Development Director Rebecca Stanze. 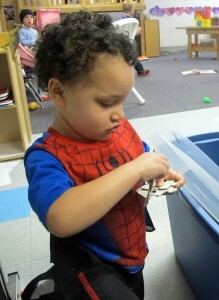 Like other Paths to Quality centers, United Ministries accepts federal child care vouchers. But Stanze says few providers receiving Child Care Development Fund dollars go to the trouble of seeking NAEYC accreditation. “They have to meet basic safety regulations — three pages worth of safety regulations — but there’s no encouragement that those federal-funded vouchers try to adhere to this 87 pages of suggestions, site visits that are done by accreditors, things like that,” says Stanze. Each rating in Paths to Quality is designed to be a “step up” from the previous level. Level 1 focuses on health and safety. Level 2 focuses on creating a supportive learning environment. Level 3 focuses on having a planned curriculum. Level 4 focuses on national accreditation. More than half of Paths to Quality providers — about 55 percent — are ranked as a level 1, and participation varies depending on provider type. Nearly 90 percent of Indiana child care centers are ranked, but only 11 percent of the state’s registered ministries. Paths to Quality is a well-regarded program. But preschool advocates are skeptical the voluntary rating system will help Indiana expand its early learning offerings. Earlier this year Conn-Powers and his colleagues looked at how Indiana compares to states that do provide public dollars for preschool, some of which have been paying for pre-K for two decades or more. About a quarter of the 81 classrooms in the dataset were rated level 3 on Paths to Quality. He says for kids that aren’t at risk — they aren’t living in poverty, they aren’t experiencing large gaps or delays in their learning, they aren’t disabled or a minority — that probably isn’t a problem. If Not This Year, Then When? If and when lawmakers approve funding for pre-K, it’s likely Indiana will build a statewide program on its existing preschool infrastructure. The pilot proposal that fizzled in the Senate Education Committee would have provided vouchers for low income students to attend already established preschools. 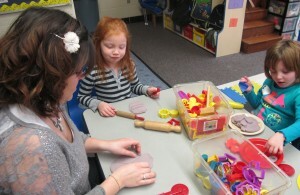 Students work with play dough at a Head Start center in Fayette County. The Center for Evaluation & Education Policy at Indiana University estimates federally funded initiatives only reach about a third of at risk 4-year-olds in the state. Sen. Kruse points out that low income Hoosier families have some access to preschool through federal initiatives like Head Start and community programs like Busy Bees, though advocates argue there aren’t enough slots to go around. Spradlin says of the estimated 42,000 Hoosier 4-year-olds considered at risk, only about 12,000 receive services through federally funded Head Start or special education programs. That leaves about 30,000 at-risk kids without access to services each year. Given how long it took Indiana lawmakers to give all-day kindergarten the green light, Spradlin says he doubts they’ll revisit pre-K before the next budget cycle, in 2015. Earlier this month Mississippi lawmakers approved $3 million for a small-scale preschool program. If Gov. Phil Bryant signs off on it, Indiana will be one of just ten states that doesn’t provide any money for early childhood education.